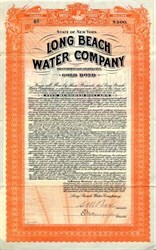 Beautiful Uncancelled Bond Certificate from the Long Beach Water Company dated in 1909. This historic document was printed by Styles & Cash Banknote Company and has an ornate border around it. This item has the signatures of the Company's President, S. M. Bard and Secretary and is over 99 years old. This is the first time we have had this Bond for sale. Report of Division of Sanitary Engineering by ALBANY J. B. A reinspection of the public water supply of Long Beach was made by Mr. Alfred Mullikin, assistant engineer, on January 7, 1920, a previous inspection having been made in 1915. Long Beach is am incorporated village in the town of Hempstead, Nassau county, having a summer population of about 5,000. It is situated on an island parallel to the south shore of Long Island, about 25 miles from New York city. The waterworks are owned and operated by the Long Beach Water Company. The water supply is owned and controlled by the Long Beach Water Company, of which S. M. Bard of New York City is president. Water is pumped from a well located near Lynbrook into a standpipe located at Long Beach whence it is distributed by gravity to the consumers. The entire population is served with the public water supply. The water consumption is approximately 400,000 gallons daily during the winter and about 1,200,000 in the summer. The average pressure is about 60 pounds per square inch. The well from which the water is derived is 11 feet in diameter and is dug to a depth of 80 feet through strata of sand and gravel. It is enclosed with a metal casing which extends to the surface. Fifty feet from the surface a concrete floor is constructed on which rests the pumps. The normal depth of water in the well is about 30 feet. The pumping equipment at the time of the inspection consisted of two turbine pumps eaeli having a capacity of 80,000 gallons per hour and operated by induction motors. Improvements, however, were being made at the time of the inspection and when completed steam power will be furnished. The standpipe is 34 feet in diameter and 150 feet high and has a capacity of approximately 1,000,000 gallons. There is a total of 12 or 13 miles of water mains ranging in size from 3 to 24 inches in diameter. The main leading from the pumping station to the stand- pipe is a 24-inch pipe. The water company owns about three and one-half acres of land in the vicinity of the plant and there are few buildings in the locality, the nearest house being about 200 feet distant. The privy located at the pumping plant is about 75 feet from the well and is provided with a shallow wooden oil barrel for a container. It was in a satisfactory condition at the time of the inspection. The water supply is obtained from a dug well 9 feet in diameter and 50 feet deep, known as well No. 1, located in East Rockaway, in the town of Hemp- stead, about 1,000 feet south of Lynbrook station of the Long Island railroad. The water company owns another well, known as well No. 2. located on the north side of the East Bockaway passenger station at Long Lane, a few feet from the Long Island railroad tracks. This well has been abandoned although when used it will yield 400 gallons per minute. At this well there is a 6-inch cross-connection with the Queens County Water Company which can be used for an emergency supply. The water from the well is pumped to the Long Beach standpipe through 20.000 feet of 24-inch force main, which is of wood stave construction except at channel crossing where castiron pipe is used. At ebb tide the force main is exposed in numerous places. Due to repeated exposure to tidal conditions in a salt marsh, the steel hands have corroded, and the wood has disintegrated to such an extent that for several years only by continual repairs has the force main been kept in service. At times of low pressure it is possible that the head of marsh water over the pipe line is greater than that within the pine and that leakage of polluted salt water may enter the main. The results of these analyses show a water of good phvsieal charactfiristics as regards color, appearance, and taste. The figures for nitrogen in its various forms, with the exception of those for nitrates, are not excessive. The rather high figures for nitrates indicate organic pollution of the ground water tributary to the supply, which however had undergone natural processes of purification. The increase in the chlorine content after the water had passed through the long pipe to Long Reach indicates the infiltration of salt marsh water. The total bacterial counts are usually moderate and from no sam-ilcs have organisms of the B. coli type been isolated from any inoculations. As a result of the investigation it was concluded that the public water supply of Long Beach was of a satisfactory aesthetic and sanitary quality at the time of the inspection ; that the condition of the long force main from the Lynbrook pumping station to Long Beach is such that infiltration of salt marsh water may occur under certain conditions; that there is some possibility of contamination reaching well No. 1 through the 6-inch pipe extending from the strainer section to the surface; that pollution of the ground water tributary to the well may be brought aibout from the privy at the pumping station in case the privy is not maintained in a sanitary condition at all times; and that the abandoned well at the East Rockaway railroad station is open to possible contamination due to its inadequate protection from trespassers and to the manner in which water is drawn therefrom by residents in the vicinity. It was therefore recommended, in a report dated January 28, 1920. that the waterworks authorities take action toward the replacing of the present woodstave force main ; that a cap be placed over the 6-inch pipe at well No. 1 , and a float and cord telltale be used to determine the well water level ; that the privy and the vicinity at the pumping station be maintained in proper sanitary condition; that the well at East Rockaway be kept securely locked, and that regular analyses be made of the supply, and if contamination be found present steps be taken to eliminate its source if possible, or to sterilize the supply with liquid chlorine.